Another card for today’s blog hop at PTI. Once again I used the hexagons from the Rosie Posie stamp set, and embossed them in white. I used three shades of pink ink to stamp the roses. I then trimmed them and adhered with foam dots. I tried to get a graphic look combining the roses with the hexagons. The sentiment is from a Simon Says stamp set. Other: Inkadinkado white embossing powder. Ooh, those roses look fabulous on the black background with the white hexagons— very striking! This is just gorgeous, Tasnim. Now i wish i’ve bought The Sweet Life stamp set :). Have a great weekend! Stunning and eye-catching. Those roses just pop off the page. Sheer perfection – love how you stamped the roses! So, so, so, so beautiful! Breathtaking! Tasnim, this card is stunningly beautiful! I love it! Really pretty!! That pink really pops against the white embossing and blk background! Gorgeous pink blooms against the white embossing! So pretty! white hexagons on a black base, jus luv it! This is so striking Tasnim! The flowers are so dramatic against the black background! Love this card! Absolutely incredible Tasnim! Your Rosie Posie hexagons are lined up perfectly, something I have always struggled with and those roses are just gorgeous! I love this so much Tasnim – it’s so very elegant! Perfect roses and your embossing is like the icing on the cake! Ot the other way round, I don’t know – it’s just plain too good!! Beautiful toned roses against the black — very stunning!! This is stunning! 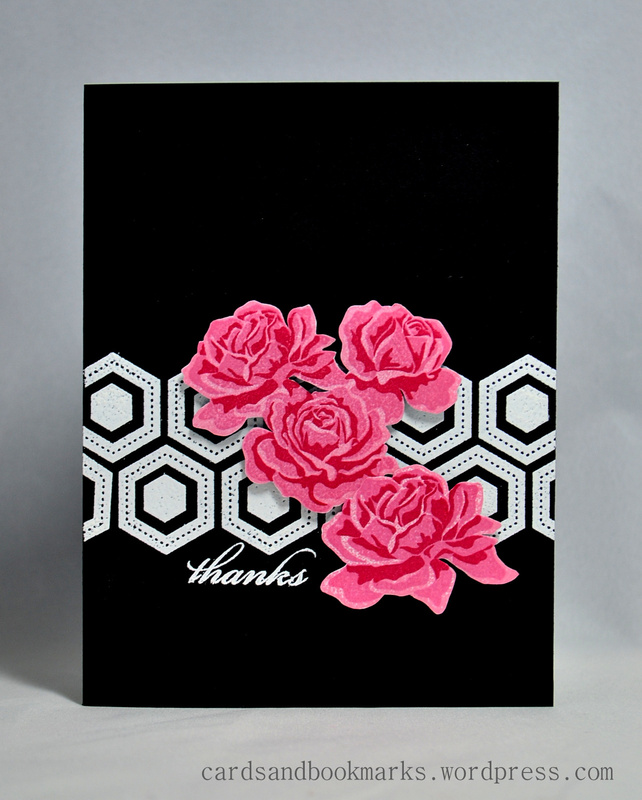 I love the white hexagons against the black with the pink roses. Just awesome! Love this one too, Tasnim! Your white is perfect behind the roses. Love how you tucked your sentiment perfectly between the petals and the hexies! Swoon… off to CASE this idea. Stunner! Great job on the PTI blog hop challenge. OMG …this is just gorgeous!! …love the way you have colored the roses …simply stunning !! Stunning card! Love juxtaposition of the graphic element of the hexagons with the roses! Your cards are gorgeous and this one is no exception – stunning! Love the bright pink roses. Love the white hexagons. Together they are fabulous. well designing for a stunning impact – love the color of your flowers! Wonderful! The roses are perfect on the black cardstock! Oh, this is lovely. The pink looks fabulous against the black.